This lecture considers Kawabata Ryūshi’s (1885-1966) monumental painting, The Capture of Luoyang (Rakuyō kōryaku; 1944), part of the important and controversial corpus of Japanese War Painting (Sensō kiryokuga ), noting its formal features, relationship to Japanese colonial control of and scholarship on Chinese Buddhist sites, and brief but significant exhibition in 1945. Figures drawn from the modern scientific imaginary fill the children’s stories of the early twentieth-century writer, poet, soil scientist and amateur geologist Miyazawa Kenji: his dreamworld is full of electric lights, railroad tracks, and dinosaur bones. But Kenji was also a devout Buddhist and deeply influenced by the Lotus Sutra. This talk examines how images of enlightened bodies erupting from the earth taken from the Lotus inform Kenji’s use of the symbols of fruit, fossil, and footprint, and how he deploys these symbols to suggest that a radiant, candy-coloured utopia might be concealed inside the rugged landscape of northeastern Japan. Melissa Anne-Marie Curley is assistant professor of Japanese religions at the University of Iowa. Her research focuses on modern Japanese Buddhism, particularly the interaction of sectarian Pure Land thought and Kyoto School philosophy. The Consulate General of Japan is sponsoring screenings of the following Japanese films to be shown at the Pacific Cinematheque　this Saturday, September 22. The Centre for Japanese Research presents Democracy’s Poster Girls: Beauty Queens and Fashion Models in Postwar Japan, a talk by Dr. Jan Bardsley (University of North Carolina at Chapel Hill). American-style beauty contests—complete with young women in tiaras, sashes, and swimsuits— became big business in Japan in the 1950s, and were even hailed as displays of women’s rights in the new postwar. Jan Bardsley will focus on one piece of this story: the rise and fall of Itō Kinuko, who captured the Miss Japan crown in 1953, thrilled her country by taking third place in the Miss Universe contest, and became the nation’s first top fashion model. As she later fell prey to charges of greed, inflated ego, and too much independence, Kinuko’s victories not only became a cautionary tale about the allure and dangers of Americanization in Japan, but also intertwined with U.S. efforts to forge alliances with Japan in the early Cold War. Jan Bardsley is Associate Professor of Japanese Humanities and Chair of the Department of Asian Studies at The University of North Carolina at Chapel Hill. She is the author of The Bluestockings of Japan: New Women Fiction and Essays from Seitō, 1911-1916 (University of Michigan, Center for Japanese Studies, 2007), which was awarded the 2011 Hiratsuka Raichō Prize by Japan Women’s University. With Laura Miller, she has co-edited two books, Bad Girls of Japan (Palgrave, 2005) andManners and Mischief: Gender, Power, and Etiquette in Japan (University of California Press, 2011). She is co-producer/director with Joanne Hershfield of the documentary, Women in Japan: Memories of the Past, Dreams for the Future (2002), Bardsley has received several teaching awards at UNC-Chapel Hill including the Tanner Award for Excellence in Undergraduate Teaching and the Sitterson Award for Excellence in Teaching First-Year Seminars. 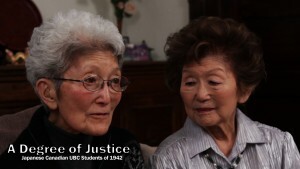 The film A Degree of Justice: Japanese Canadian UBC Students of 1942, which was shown during last week’s symposium, is available to view online. Please see the Japanese-Canadian Student Tribute site for more details on the commemorative events. 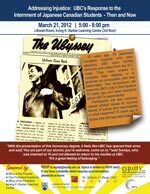 The webcast of the symposium “Addressing Injustice: UBC’s Response to the Internment of Japanese Canadian Students – Then and Now”, which took place on March 21, 2012 is now available online. The symposium looked at the removal of 76 Japanese Canadian students attending UBC in 1942. More information is available through the UBC Equity Office website. Click here to go directly to the webcast. Click here for the program poster. The BC Japan Earthquake Relief fund is offering a special concert on March 11, the anniversary of the Japan disasters. For details check the BC JERF website. UBC Library will be hosting an exhibition and one-day conference to commemorate the March 11 disasters in Japan. See below and the event page for more details. University of Toronto Professor Emerita Sonja Arntzen will be speaking this Friday at Asian Centre as part of the Kameyama Lecture series organized by the Asian Studies Department. September 30 (Friday) @ 5:00 p.m.
For more details, check out the pdf here.